All sorts of things have interfered with my fishing this week Delivering my one of my grandsons to school, viewing houses, visits to the dentist and trying to recall a bit of freshwater biology. 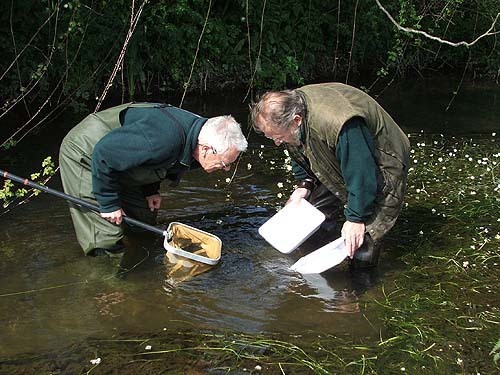 A few weeks ago I was asked to help out making a radio programme about mayflies. 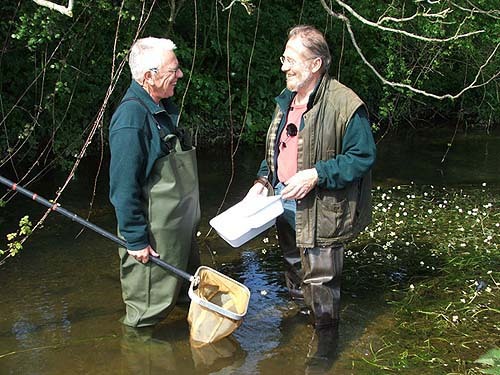 (In my former life as a freshwater ecologist I had a passing interest in these creatures which spend two years living in the sandy/gravelly bed of chalk streams before emerging to mate, lay eggs and die in the space of a few days). Sarah Blunt the producer, Lionel Kelleway the presenter and myself arrived at the appointed place on time and the day of the recording dawned bright and sunny - a minor miracle! Despite heavy rain on the preceding Saturday the river was low and clear. I had another appointment so we had to start earlyish (9 a.m.) - a bit early for the mayflies as it turned out. Anyway, to cut a long story short we had a very amusing morning getting all the tape that Sarah needed. Mayflies (Ephemera danica) are fascinating creatures. Apart from their value as fish food and as models for fly tiers they have amazing habits. The larvae (nymphs) burrow in the stream bed and feed on tiny particles of food captured by an elaborate system of gill pumps and mouth filters. Their way of life makes mayfly larvae particularly vulnerable to pesticides and other chemicals that find their way into the water. To add injury to insult, as they emerge, they are devoured by every bird and fish in creation. Anyway, enough of mayflies, what about the fishing? In fact I only went once on the Saturday morning. I arrived at the coast at about four-o-clock in the morning and it was like the rush hour. Two anglers were already fishing and two more arrived as I did - very unusual. I knew the other anglers so we said our hellos and set about the serious business of trying to catch a bass. I started off with a small Rapala and as the first light appeared in the sky I hooked and landed a two pounder, just the job. A few minutes later one of the other blokes had a fish of similar size. More or less what we expected from the spot we were fishing. It sounds daft but I decided to leave the others to it and brave the heavy surf over the flat rocks in search of something bigger. Their was a stiff cross wind so the little balsa lure would have been useless for casting. 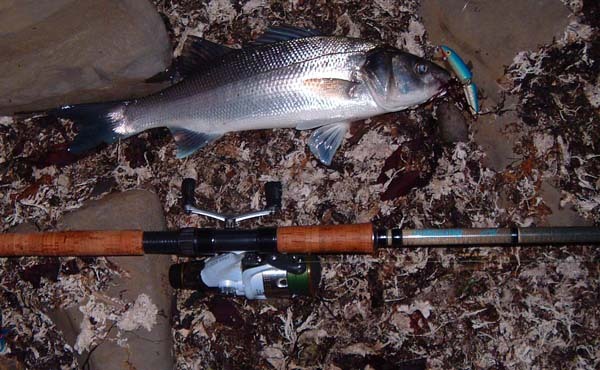 I changed to a medium sized popper, waded into the roaring surf and began to fish. It was soon apparent that the lure was going to skate in the wind. so it was back to the bag for something else. I tried a Crystal Minnow but this time the lure was diving too deep (that'll give you some idea of how shallow the water was) and kept catching the rocks. I decided that discretion was the better part of valour and before I lost the lure it was back to the bag again. This time I chose a very shallow diving 'Maria' plug - perfect. It went out like a rocket and (as long as I did not wind too fast) fished about six inches under the surface. For a while there was nothing, apart from a gannet which caught a fish about fifty metres out, then suddenly I was in. The rod jagged over and the clutch began to give line. What a feeling that is! It was obviously a good fish and took me a couple of minutes to subdue in the heavy surf. Eventually I had it under the rod tip and swimming around my legs - about seven pounds I estimated. I began to wade back to the beach to land it and get some pictures. 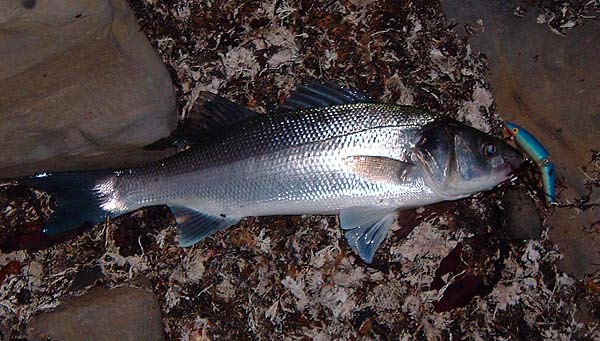 As I was about to slide the bass ashore it turned seawards and made a last effort to escape. The hook hold gave and it swam away. That's fishing! I was a bit disappointed but I would have put it back anyway and I'd had most of the fun so it could have been worse. Sorry there's no picture.